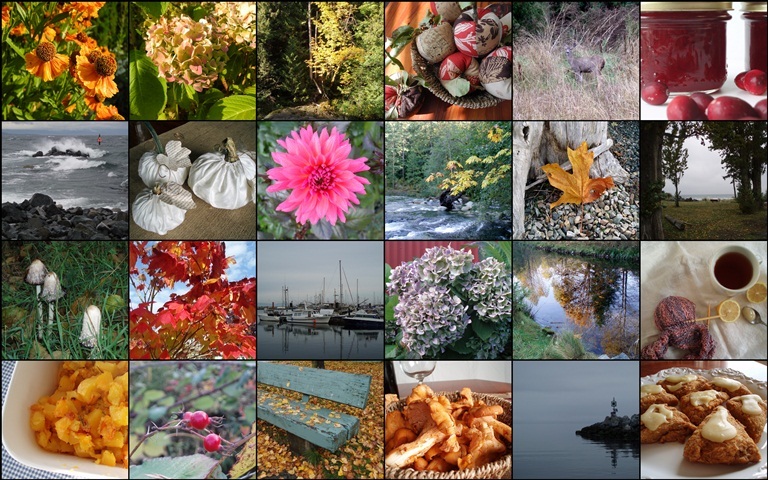 In blatant imitation of Vee's brilliance, I've created a mosaic from photos of Octobers past, along with a few from this September. There's much to love about autumn and it vies with summer as my favourite season. Melissa from The Inspired Room encouraged us to make a list about 20 things we love about fall. It wasn't hard to come up with such a list. Here's mine and I wonder how many things you love about the season, too. Gorgeous autumn mosaic! And thanks for the tutorial on the apples! Nothing like adding your birthday to this special season! I love the photo of the Sooke Hills which reminds me of where my parents retired and built their home with a beautiful view. I know you'll be enjoying this week of preparations for Thanksgiving! What a gorgeous post, I will dwell on my 20 things all day today. Will you share your recipe for apple crisp with custard sauce? I have had mine with vanilla ice cream, Cool Whip (gack! ), and just milk poured over, especially to cool it hot out of the oven. But the milk thing just isn't the way it used to be when I was a kid. Back then we had fresh goats' milk, or whole cows' milk. Now it's always skim. Just not the same. Maybe, I'll mark C.T. this year, kind of a dress rehearsal for new recipes I might like to try with the bigger crowd on Amer. T.G. Are they any traditional foods for C.T.? (Yikes! That's next Monday! Better get crackin'!) In my area, we border on Canada, (New Brunswick and Quebec), so there are many French Canadian traditions. This is the time of year for tortiere, which is a kind a pork pie, I think. I've never made one, but they are available in the grocery stores! I like your list! I had long forgotten about fires in the fireplace...and scarves. Enjoy the season! It's always such a pleasure to visit here Lorrie...what a cozy, comforting list...it evokes so many of my favorite things. Sadly, we are having a heat wave here in soCal with todays' highs hitting the nineties...definitely NOT autumnal weather. Rosie (my daughter) is lamenting the lack of classic fall coolness as she's craving pumpkin bread and down comforters. I promised her I would get up early tomorrow while it's still cool and make her some pumpkin spice bread in honor of October. :))) I hope you have a wonderful birthday month and a very happy day!!! Great idea (inspiration!) to create a fall mosaic! Apple tart and custard is one of our favourite desserts to have on a Sunday here in our home in Ireland. I love the mosaic. And I'll be compiling my own list of at least 20 as I head to work this morning. Shiny brown chestnuts bursting out of their bright green spikey covers will be on it. Happy Birthday to you!!! We have a couple coming up in our family too. Fall is a glorious time of year and I love apple crisp. I've made a couple already and have a lot apples in the frig. yet. I loved your list and your cool collage. Love the mosaic and your meme apart from the custard! !